Thanks you for your logo votes, for the lovely feedback and for the amount of thought that went into some of the responses. I had 40 replies (although a couple of them were to tell me I’d messed up the email and one to ask to be removed from the list.) and the winner is logo 2 by 19 votes to 11 votes. It was generally agreed to be clearer, a “more balanced design in aesthetic terms” and less “confusing for the brain”. 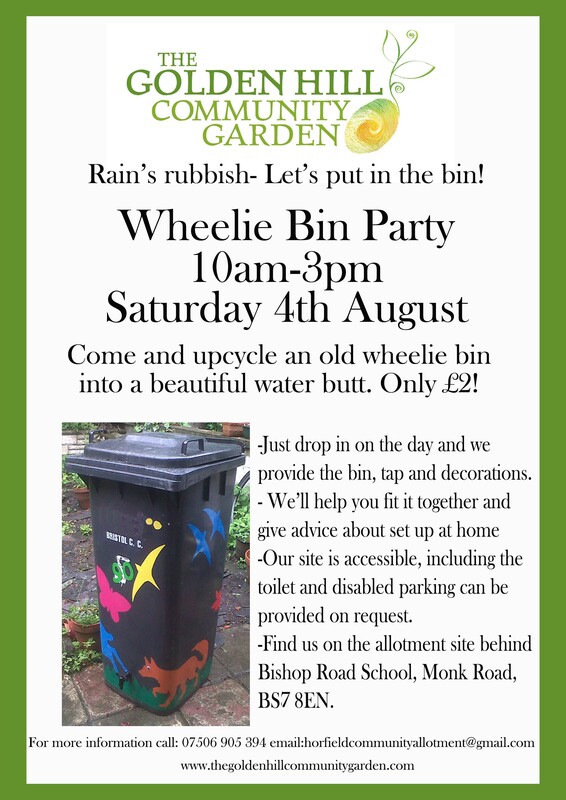 So here is the new logo in action on the poster for the Wheelie Bin Party on 4th August. Let me know if you’d like me to drop a copy off if you live near the allotment and could put it up in your window. I’ve not managed to do a poster yet without a glaring spelling mistake so if anyone spots one please let me know as I’ll be printing them out tomorrow. If you can help on the day that would be fantastic, it’d great if we had a cake stall (what event isn’t improved by a cake and a cup of tea??) so all and any cake and biscuit donations very welcome. Also we’ll have lots of vinyl and templates for people to decorate the bins so it’d be great if any creative sorts to help with that on the day – it should be mess free and easy for kids to do as well. Any help is also welcome in the run up as we need to drill holes in all the bins. Monday evenings and Wednesday days are ticking along, we’ve the first baby chilli’s peeping through the plants in the poly tunnel and courgettes on their way outside, so I guess it must be summer. This entry was posted in News from the Garden on July 10, 2012 by GHCG.